Can Aaron Harang Replicate Jon Garland’s Formula? Pitcher A is Jon Garland before joining the San Diego Padres; Pitcher B is Aaron Harang through the 2010 season. Harang has agreed to a one-year deal with the Friars worth $3 million, making the comparison apt and timely. Garland boosted his reputation by turning in an impressive 2010 season. A combination of 14 wins, 200 innings on the nose, and a 3.47 ERA has that sort of effect on opinions. Can Harang manage the same? Harang was one of the National League’s finest starting pitcher from 2005 to 2007. His average season included 14 wins, 226 innings, a 3.77 ERA, and a 3.75 strikeout-to-walk ratio. He ate innings, he won games, he avoided walks, he struck batters out, and he did so while pitching in a hitter’s park. Since then, Harang has struggled to recapture any semblance of those seasons. His average season in the past three seasons: 6 wins, 153 innings, a 4.71 ERA, and a (still very good) 2.88 strikeout-to-walk ratio. Some would call the 32-year-old hittable nowadays. His batting average on balls in play over the past two seasons tops .330. Prior to 2009, Harang’s BABIP had topped .320 over an entire season only once, and that came when he was much younger. One of Harang’s career-long ailments is home runs. Yet, believe it or not, his flyball per home run percentage is roughly league average (11%). The issue with Harang’s homers is not the percentage of flyballs they represent, but rather the percentage of batted balls that are flyballs. That’s nothing that a prolonged stay in the super-friendly confines of Petco Park (and the Padres’ likely to be very good defense) can’t potentially help fix. With that in mind, don’t be surprised if Harang becomes a worthwhile sleeper pick in NL-only leagues. For more on Aaron Harang and other starting pitchers, check out Bloomberg Sports’ Front Office. smartest move of his career. than his career xFIP of 4.62.
season. However, Bloomberg Sports’ Fantasy Tools warns us of some rough patches ahead. Petco Park can’t prop him up forever. 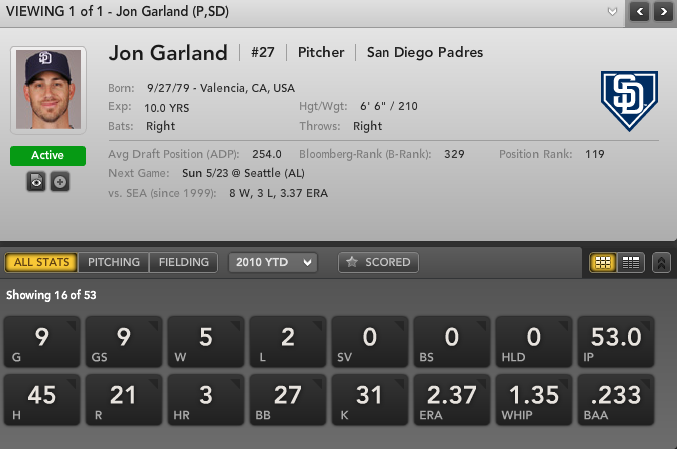 For more on Jon Garland and the surprising San Diego Padres, check out Bloomberg Sports’ Fantasy Tools.